The Theropsids or "beast (mammal) faces" constitute an evolutionary lineage that developed a special opening, the synapsid arch, for attachment of jaw muscles, giving a superior bite and permitting adaptive radiation during the late Carboniferous. These basal forms evolved through the primitive pelycosaur stage, to the therapsids or mammal-like reptiles, and finally the mammals themselves. Pelycosaur, therapsid, and mammal represent three evolutionary grades in a single progressive evolutionary axis. The therapsids, as forms transitional between basal amniote and mammal, can be thought of as occupying the same evolutionary space as the dinosaurs, which are transitional between reptiles and birds, do. When we look at the history of the Theropsids we see that the lineage can be further understood in terms of evolutionary "pulses", each pulse corresponding to a major biota. The following diagram and associated text, from Janis & Damuth (1990), shows the major pulses (although two Permian ones have been left out! ), and other tetrapods that were contemporary. "Note: Taxa illustrated are designed to give a flavour of the range of types of mammal and other vertebrates in each time period, and are not meant to be a comprehensive listing. Body mass ranges are approximate estimates based on overall body size. Pulse 1 Permian): Pelycosaurs . Unspecialized medium- to large-sized amniotes (20-100 kg). Sprawling posture, ectothermic, tropical distribution. Pulse 2 Early to Middle Triassic). Therapsids. Probably higher metabolic rate than pelycosaurs: 'improved' posture (more of a para-sagittal stance) and greater volume of jaw musculature. Wider geographical distribution (tropical and temperate zones). Size range 10-500 kg. Pulse 3 (Late Triassic): Cynodonttherapsids. Evidence for at least some degree of endothermy: diaphragm, secondary palate, differentiated dentition, masseter muscle in jaw. Size range 0.5-30 kg. Pulse 5 (late Early Cretaceous to latest Cretaceous): First therian mammals. Concurrent with radiation of angiosperm plants, see appearance of therians with tribosphenic molars (cheek teeth that can crush as well as shear). Split of therians into placentals and marsupials happens at this time. Multituberculates(non-therians) also diversify and obtain more complex cheek teeth. Size range up to 5 kg. Pulse 6 (Early Paleocene to Middle Eocene): 'Archaic' therians plus didelphoid marsupials. Taxa seem mainly characteristic of tropical-type forest habitat world-wide. See first true carnivores and semi-aquatic herbivores. Size range up to 1000 kg. Pulse 7 (Late Eocene to Recent): Modern therians, marsupials confined to Australasia and South America by Middle Miocene. Mammals inhabit diverse habitats, radiation of specialized groups such as bats, whales, cursorial mammals, hominoids. Size range 0.002-5000 kg (terrestrial) or to 100000 kg aquatic)." Each of these pulses is a major evolutionary radiationof the Theropsid lineage. And each follows the other sequentially. The evolutionary systematic diagram to the right from Carroll (1988) shows how this works (note - time shown the opposite direction (bottom is oldest) to the preceding diagram). The branches of only the first two pulses mentioned here, the pelycosaurian and the Therapsid (the cynodonts and mammals are indicated but the numerous sub-branches are not shown). 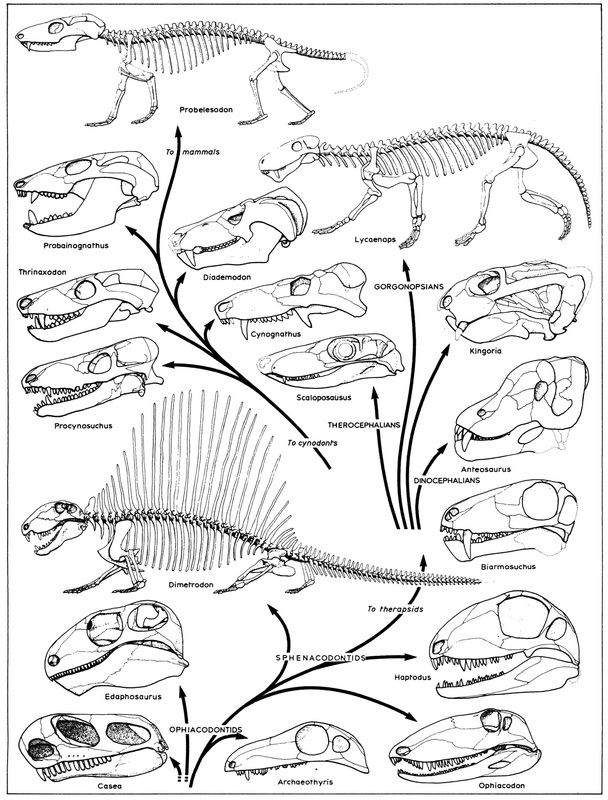 The Permo- carboniferous sees the flourishing adaptive radiation of the various pelycosaur groups (bottom left of the diagram). Then, as these decline due to changing environmental conditions (with only a few stragglers making it through to the middle Permian) the new adaptive radiation of the Therapsida takes off. This itself consists of a number of subgroups, one of which, the cynodonts, itself initiates a new adaptive radiation, from one line of which the mammals emerge. And so on. Synapsida: defined as Confuscius > Confusciusornis (i.e. mammals > reptiles). Dilkes & Reisz (1996). Varanosaurus. Amniota : Sauropsida + * : Caseasauria + Eupelycosauria. 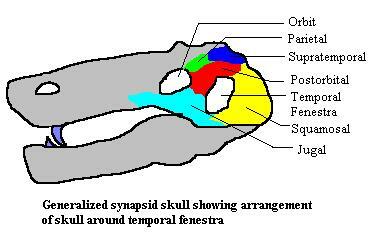 Characters: Larger skull; septomaxilla columnar, with broad base straddling maxilla-premaxilla suture; $ lower temporal fenestra present, bounded by postorbital, squamosal and jugal, with ventral margin formed by squamosal and jugal (excluding quadratojugal); $ supratemporal and postorbital meet and exclude parietal from squamosal; postorbital extended posteriorly (probably related to reinforcing skull weakness caused by fenestration); post-orbital skull typically axially short and dorsoventrally tall; plate-like supratemporal retained; tabulars large; postparietals fused; occiput slopes and faces postero-dorsally; posttemporal fenestra small, bordered by supraoccipital, tabular & opisthotic; 2 coronoids retained on lower jaw; canine fangs; pectoral girdle tends to develop late and retain sutures between 3 centers of ossification (anterior & posterior coracoids, scapula); large medial centrale in pes; limited color vision (tendency to be nocturnal); glandular skin; complex, hardened forms of beta keratin absent; excrete urea (not uric acid). Dilkes & Reisz (1996); Reisz (1972).